I had the privilege of working with Westside Wholesale for this post. I was provided with a store credit and asked to do a review. All opinions are 100% my own. budget friendly if I were paying out of pocket. My thought is, I don't want to do anything I wouldn't be doing anyways just to score free products or make some moola. We on the same page? So, that brings us to my recent collaboration with Westside Wholesale. They approached me after seeing some of our DIYs and offered me store credit and asked me to do a review of their site. Before committing to working with them, I perused what they had to offer and was pleasantly surprised. They have a nice selection of Home & Kitchen, Heating & Cooling, Lighting, Ventilation etc...like a online warehouse store. They prices are competitive (if not better) with stores like Home Depot and Lowe's and they offered some products that you won't find unless you go to specialty stores or order online. They also offer a reward system where you can earn store credit. Plus free shipping on orders over $199 or flat shipping of $8.95 of orders under $199. Basically it seemed like the sort of store I would totally shop at. WIN! 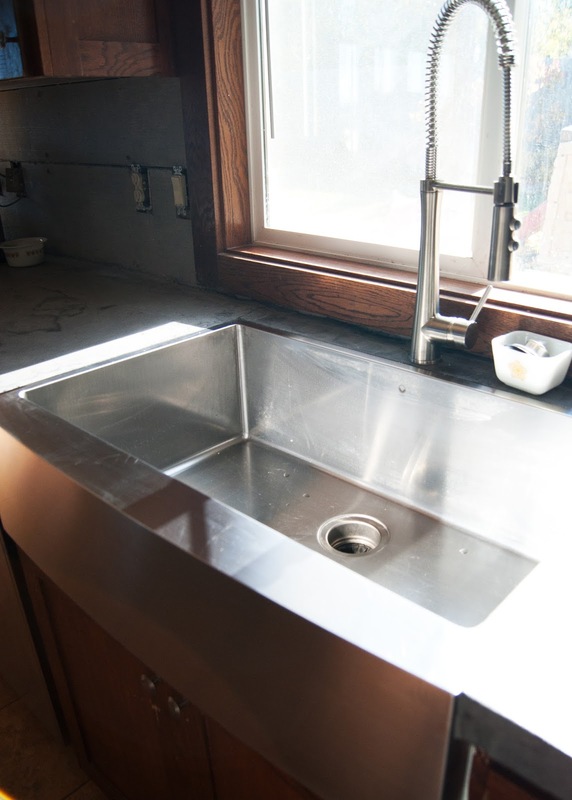 Inside the box was this GORGEOUS Vigo Stainless Steel Apron Front Sink that totally dwarfed our old one! The sink came with some basic instructions and recommendations, but not much. It even stated that each sink install is unique so they couldn't tell us exactly what to do. 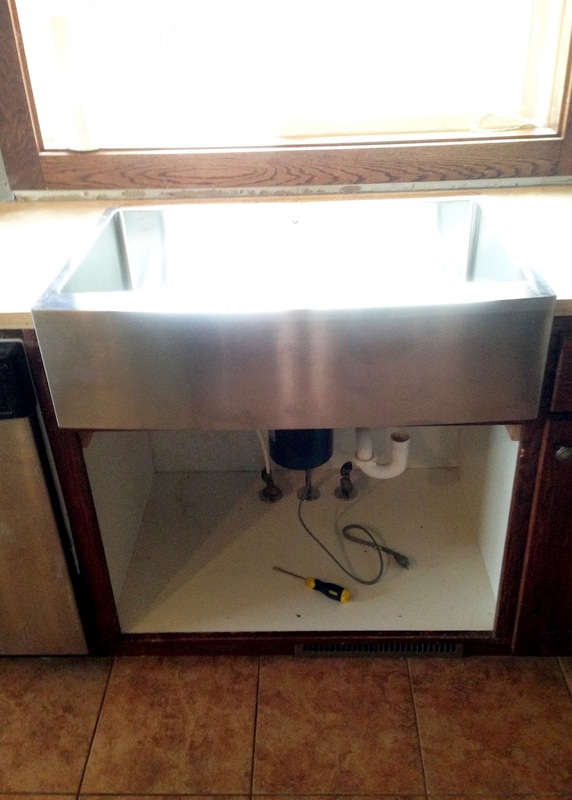 So we did what good DIYers do, we measured A LOT to make sure the sink was going to fit. We laid the sink on the counter to mark where we planned on cutting away the laminate counter and the front of the cabinet. 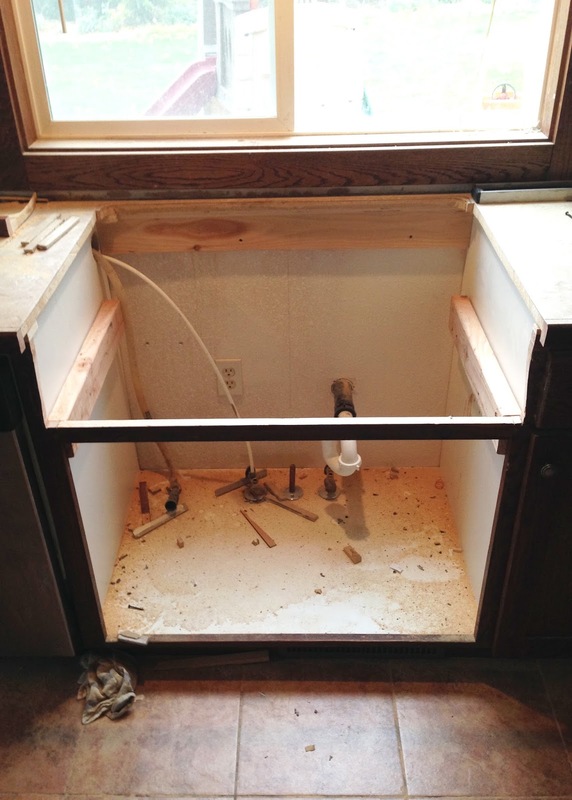 We lucked out because normally a apron front sink requires a special base cabinet, but in our case, there was just enough room to remove the front faux drawer and lower the brace spanning the cabinet by 1/2 inch without interfering with the placement of the doors. We also added two braces to the sides of the cabinet using 2x4 to act as the main supports for the sink. We did have some minor errors, but nothing a little caulking and coat of paint on the cabinets can't hide. Because we were trying to preserve our cabinet with as little modification as possible, we chose to install our sink as an above mount (you can install apron fronts 3 ways : under mount, flush mount or top mount), this meant that the sink sat about 1/2 inch higher than the counters, not ideal for how I wanted our kitchen to function -just imagine the gunk that would build up. 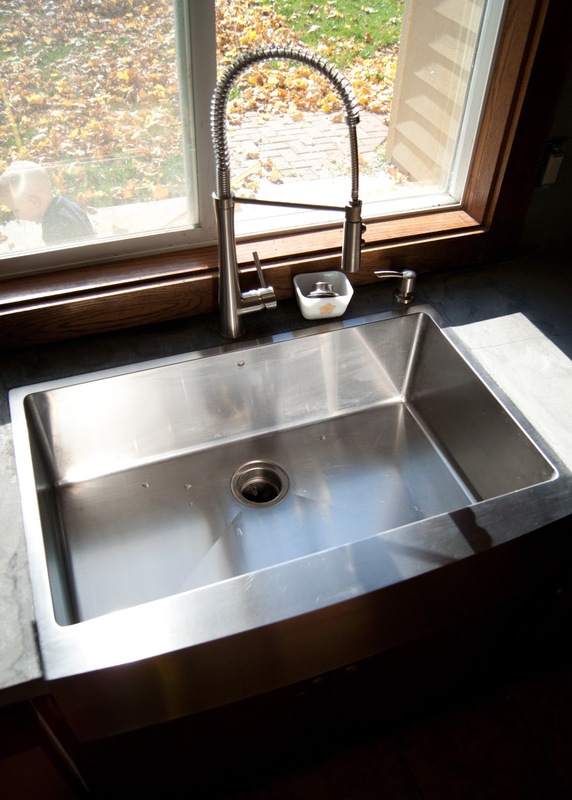 To solve the height issue we actually chose to pour concrete counters using the raised sink edge as part of our forms. I won't get into the details of the counters here (be looking on a full post soon!!) but by doing so it turned our above mount sink into a flush mount. The last thing we did was install our faucet and add a new ring to mount the garbage disposal. I'm 100% happy with this sink! 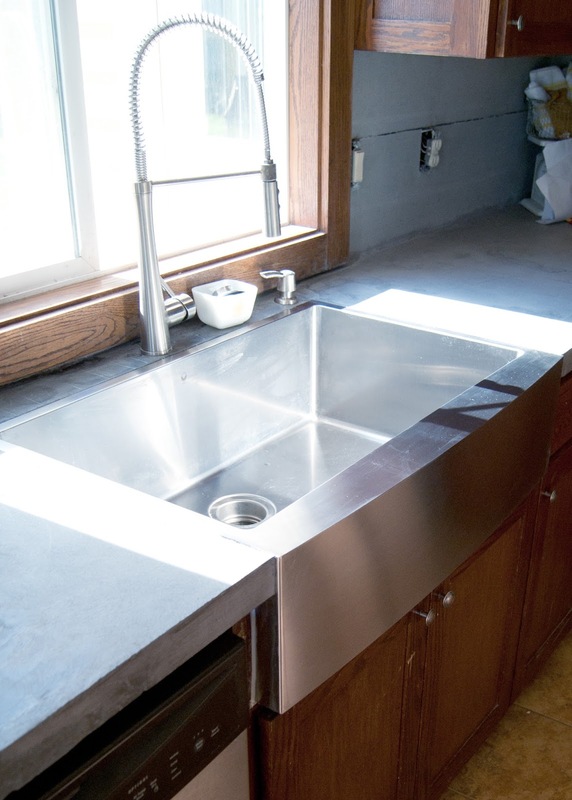 Like seriously, this sink is any cooks best friend. It's gigantic and shiny and hides a TON of dishes. I also couldn't be happier with the service from Westside Wholesale. 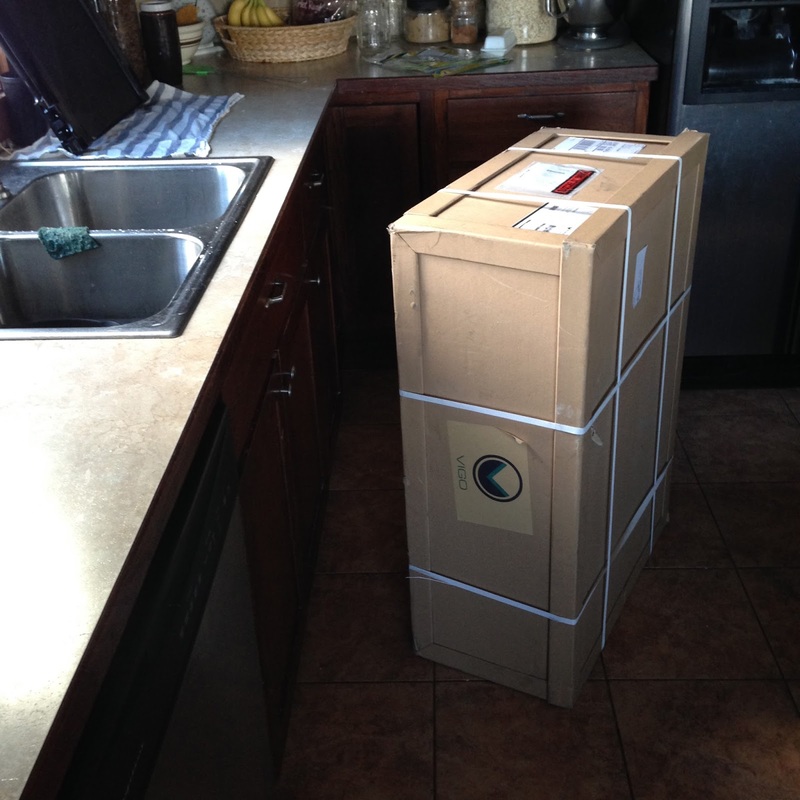 It was fast delivery, the product was exactly what I wanted and the price was pretty awesome!! My only complaint is that since your shopping online, you have to have a little faith in what you're ordering - make sure you measure properly! I'd also recommend reviewing their return policy as well. That said, I would definitely suggest adding them to your list of places to check when shopping for DIY and Home Improvement supplies. - replace back splash - demoed!! 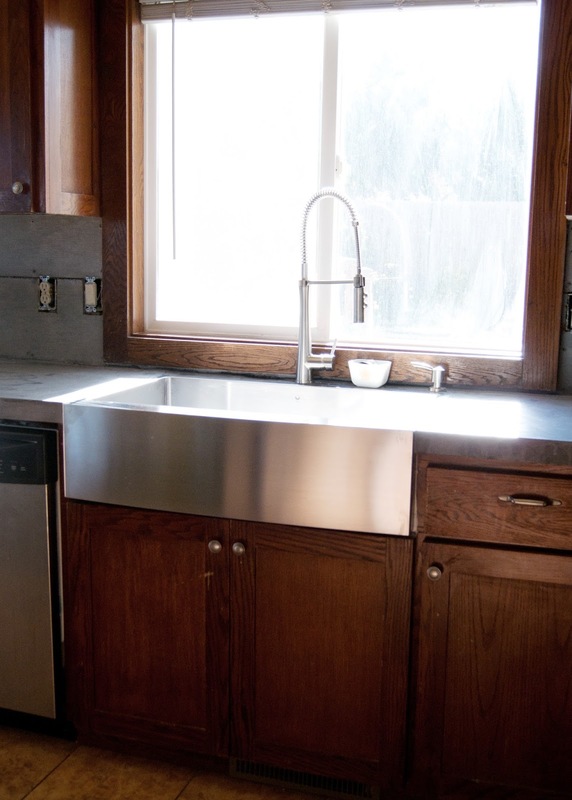 Be checking back for more about the counters and faucet installation!